Once upon a time not really that long ago in his grandmother’s kitchen not far from here a little boy opened up a cupboard and proceeded to methodically remove all the labels from the canned food. I remember my mom laughing and saying she never knew what they would be preparing to fix for lunch or supper. At the heart of that humerus and true story lies a much deeper and true story. It is unfortunate that we are guilty of placing labels on ourselves and others that need to be removed. One such label is the label of being poor. Being poor is never a good thing and like Jesus said, “you can do what is good for them whenever you want,” but by placing labels on those who appear to be poor we are labeling ourselves and saying much more about ourselves at the time. Sometimes those who are poor are richer then those who are rich, and sometimes those who are rich are poorer then those who are poor. All is not how it seems! Oh, there is one more label that both the poor and the rich need to remove, and that is the label of pride. 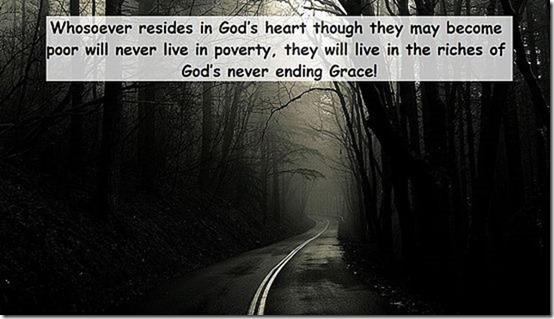 Whosoever resides in God’s heart though they may become poor will never live in poverty, they will live in the riches of God’s never ending Grace! Hermes, K. J. (2009). Beginning Contemplative Prayer: Out of Chaos into Quiet (p. 29). Boston, MA: Pauline Books & Media.